Bulletproof Collagelatin Review | Does It Work? Bulletproof Collagelatin Review – Is This Product Safe To Use? 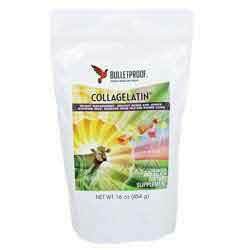 Bulletproof Collagelatin is a natural source of collagen that is mixed with meals and taken orally. The producers claim that this easy to take supplement will give your body the necessary collagen needed in an easy and effective method. The product is available in a 454g container that retails at $39 from the official website (exclusive of shipping and handling costs). This price varies depending on the site you buy it from. What is the Company Behind Bulletproof Collagelatin? Bulletproof Collagelatin is a dietary supplement that is designed to be integrated in meals and drinks. It is made from hydrolysed collagen that is needed in the body especially when we age. The producers claim that the ingredient used in this product are harvested from natural sources (cows). The product is available over the counter without a prescription. The company behind this product is known as Bulletproof 360, Inc.
What are the Ingredients Used in Bulletproof Collagelatin? There is only one active listed by the manufacturer of Bulletproof Collagelatin. Hydrolyzed Gelatin – It is derived from collagen. It is a good form of protein since it has a triple helix built out of amino acids. The structure of the helix is elastic and tough meaning that it is not easily broken. How does Bulletproof Collagelatin work? Bulletproof Collagelatin is like a collagen boost. It is meant to restore damaged and worn out cartilage in your system. The producers claim that the product is made from pasture-raised cattle and thus makes a powerful source of vital amino acids in our diets. Collagen and gelatin have been scientifically proven to provide some essential amino acids needed in our bodies. For the best results you should take this product continuously for at least a month. The producers of the product provide you with recipes to prepare the product. The product is manufactured in a facility that processes other products. What are the Dosage Instructions of Bulletproof Collagelatin? There is no dosage instruction on how to use this product. You can literally use it on anything you feel like. It can be mixed with meals or drinks. There are so many recipes available on the official website on how you can take this product. You can add to your food when cooking, to your soup, ice-cream, milk shake you name it. Are there any Side Effects associated with Bulletproof Collagelatin? By the time of writing, there were no side effects associated with Bulletproof Collagelatin. In case of any side effect, you should treat it as an allergic reaction and in case of severe reaction, discontinue use and consult your caregiver. The product is made in a facility that also makes tree nuts, peanuts, egg, soy, milk, wheat, fish, and crustacean shellfish and thus you should be careful when taking it in case you are allergic to either. Women who are pregnant or breastfeeding should consult with their caregiver first before taking this supplement. Bulletproof Collagelatin is not a scam. The product has some incredible good reviews with so many people making creative unique recipes with this product. All the same, you should use this product as advertised and for the recommended purposes only. The producers of Bulletproof Collagelatin defied all the odds and put their money where no one else dared put. This is a relatively new concept and it seems to be working well for them. Bulletproof Collagelatin has some impressive reviews, especially from foodies. All the same, we believe that the producers could have considered pricing the product cheaper. When all is said and done, Bulletproof Collagelatin is quite a unique product in the market.